AFTER a fast and furious few days, both in the sales ring and on the track, Triple Crown Syndications have returned having acquired an exciting string of six yearlings from the Magic Millions Gold Coast Yearling Sale to race in the red. The vibrancy of the sales ring was reflected by increased averages and clearance rates for the sale as buyers flocked to recruit the future champions, and Chris and Michael on the Gold Coast were active in securing three colts and three fillies with stellar pedigrees to race over a variety of distances for our owners. Among those to possess the potential to race at the highest level is a gorgeous filly by three-time Grade 1 winner in America Medaglia D’Oro, whose progeny include top-class fillies Rachel Alexandra and seven-time Grade 1 winner between 1400m-1800m, Songbird, while he is also the sire of 2015 Golden Slipper winner Vancouver. Adding further depth to the pedigree is the fact her dam, Compton Rainbow, is a half-sister to Mahler, the Melbourne Cup third from 2007, and there is every hope this filly will be able to compete at the same level and rate a potential Melbourne Cup horse. However, speed was the order of the day for our first purchase of the sale, Lot 292, a powerful colt by All Too Hard out of Gimcrack and subsequent Group 3 winner Our Joan Of Arc. All Too Hard has made a solid start to life as a stallion, with the Caulfield Guineas winner by Casino Prince siring several placed horses this year, and there is every chance he could prove himself further as a sire in his second year. This strong colt is likely to be an early 2yo type, which we hope can give owners a quick return for their investment. First-season sire Sizzling, who was prolific in his 2yo racing career, winning the Group 1 TJ Smith at Eagle Farm over a mile, has two of his progeny heading back with Triple Crown, including a colt out of four-time winner Satsang, whose two foals to reach the racetrack to date have both been winners themselves. Our second yearling by Sizzling is out of a stakes-winning mare and half-sister to high-class filly Family Portrait in Cubic Cat. There is a strong pedigree behind this colt, who rounded off the sales activity for Triple Crown, with plenty of winners filling the page and he looks a fantastic mover who can make a mark for the freshman sire. All Too Hard also has a filly bolstering our ranks, out of Gold Coast Guineas-winning mare Chakvetadze. The eight-time winner has already produced a filly to be triumphant on the racetrack, and with second dam Gotha producing nine winners from the 11 who raced, this filly looks likely to be a prolific winner herself. 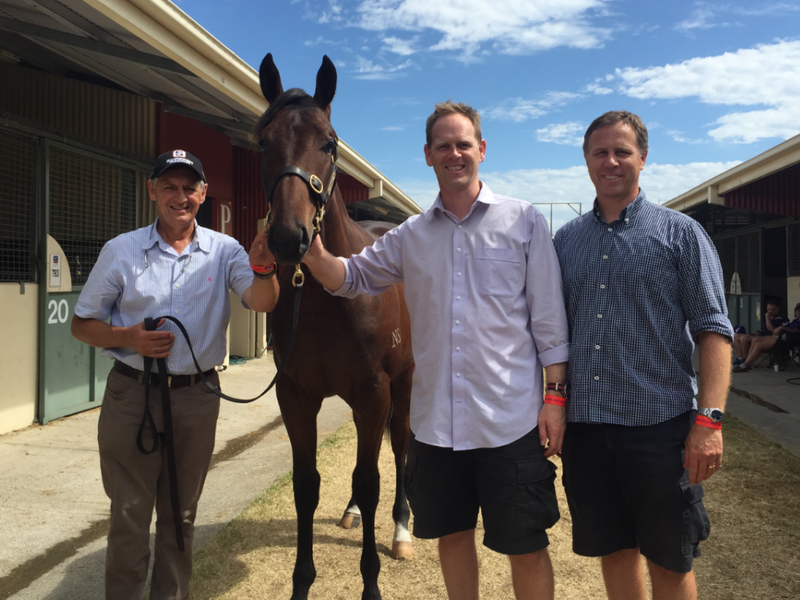 On Friday, Triple Crown secured an exciting filly by two-time Group 1 winner Exceed And Excel, who has among his progeny several successful fillies including Golden Slipper winner Overreach. Exceed And Excel has had a significant influence on the dam side, with a daughter of the third dam, November Snow, producing two Grade-race winners in the USA by the Champion Sire, in Kuroshio and Believe’N’Succeed, which gives confidence that our filly has every chance of being a success. We are thrilled to have secured such high-class yearlings at this proven sale, and look forward to racing them in the red silks of Triple Crown Syndications soon.